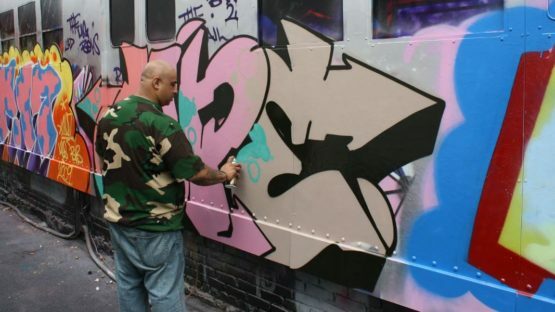 Cope2, born as Fernando Carlo in 1968, is one of the pioneers of New York graffiti art. Great, ingenious, controversial, admired, arrested, loved and respected, this legendary artist has been active in the street game since 1985. The first graffiti he ever wrote was on a train done in his wild style manner. The international credit came in the 90’s after he went through a troublesome time of working with gangs, living on the streets, and fighting to evolve as an artist. To pursue a career in street art was not his initial desire, however, the spontaneous jaunts to lettering and tagging brought him to where he is now – a legend of the Bronx style and a true mainstream graffiti star. His personal best are the throw-up style wobbly letters, made out of two different styles, the wild style, and some hard lines. They are readable, recognizable and appreciated both in large formats on the walls, and in smaller scale inside many galleries worldwide. He started writing in the late 70’s, early 80’s when New York only started being the center of street art. Inspired and influenced by this cousin Chico80, Cope2 was painting at night, riding the subway and watching all the names of Big Apple’s legends pass him by. Born in Southern Brox, he had everything but the easy childhood. Coming from diverse ancestry, American and Puerto Rican, Cope 2 emerged in both cultures, never giving up on his roots, but adapting himself to the rough style of hip-hop and street life. His first tool was a marker, and the first canvas was the wall on the stair of the building he grew up at. Joining the forces with his cousin Chico80 and Nano, he tagged his first subway train cart, actually the four of them. The excitement and feeling of accomplishment followed by adrenaline set the path for him, and he could never go back. He didn’t want to either because just some years after the first tagging he formed his own crew, the famous KD, Kids Destroy, that later changed to Kings Destroy. The King line originated from his graffiti ancestors, where the popular line was to tag King on every line, the King being a hard earned a title for every expedition one went on. Naturally, Cope2 started ruling his own kingdom and spreading the borders across the Bronx all the way to New York. As the 80’s were coming to an end, a lot of graffiti artist were dropping out of the scene and leaving spray paint for good. There were many gangs in New York, problems with drugs and police force so many artists chose to cooperate with drug lords, dealing on the streets just to earn basic income. After the series of undercover operations, many artists were arrested or settling as double agents. Cope2 had a way of coping, but many others left the scene. Adventurous spirit drove him all over New York, not the just Bronx, as he enjoyed tagging. He teamed up with Per FX, Jez, Cap and painted not just trains, but walls also. At the end of the 80’s decade a traumatic experience got him to try to change his lifestyle, as he nearly faced death in street shooting, drug related of course, and after two weeks being indoors he decided it was time to stop living dangerously, but not adventurously. 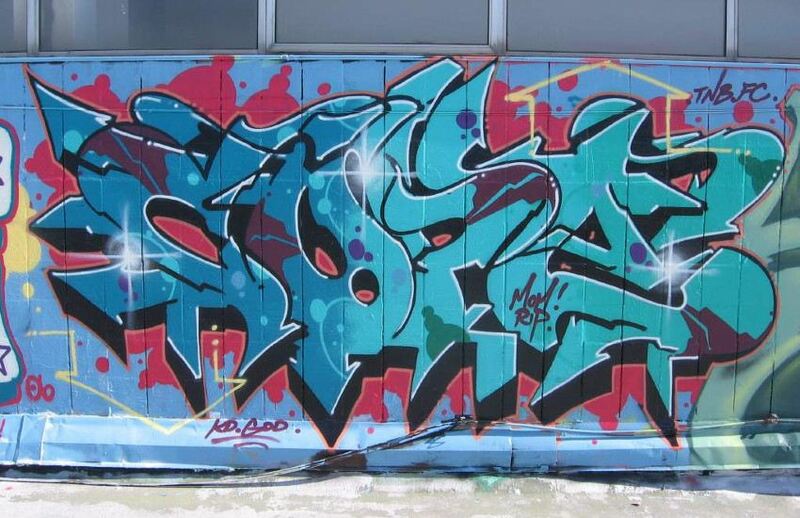 If we had to summarize Fernando Carlo in one word, or better two, we would say Cope2 is as wild as his throw-ups. 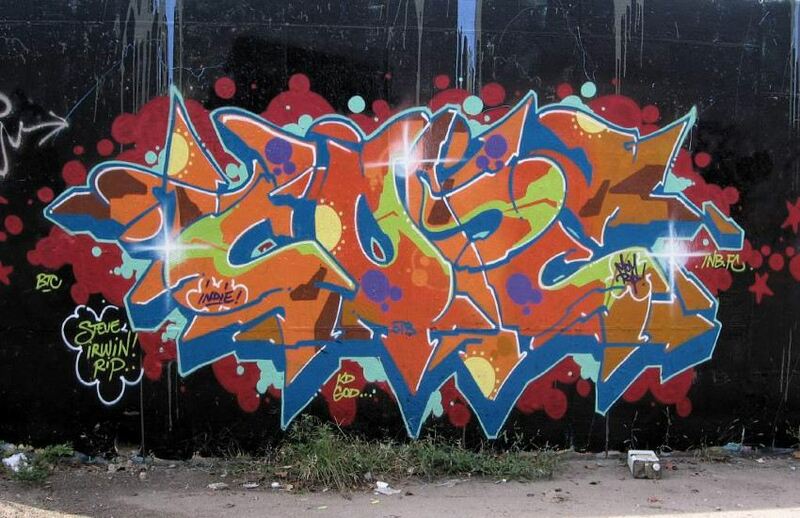 The famous mix of styles, semi wild-style, and throw-up got him major wall space and in 1993 he joined Per FX in excursions all over the city. The younger artist started looking up to him, older writers respected him, police hunted him, while he was tagging where he wanted. An interesting fact is that he did not change his style for over 40 years. The throw up is usually something between the tag and a bomb, where the outline is filled with one layer of color. This method was very popular in the 80’s since the police were always onto the graffiti artist, and they did not have the luxury of time to complete their works in detail, so a quick delivery was a perfect solution. Throw-ups were also very popular among street competitions, where one could easily paint dozen of them in a jiffy. Cope2 liked his throw-up, because, besides the tag, it was part of his identity, legacy and served as a token of recognition, self-promotion, and self-respect. The 90’s were a golden period for Fernando Carlo, who started getting his first commissioned contracts and opportunity to collaborate with famous brands. He did work for both Adidas and Nike had international exhibitions and continued to inspire others. However not everything was coming up roses, there was a huge battle going out among the group of artists who worked with him. It happened few times that Cope2 was painting a wall, and a few days later a word Snitch would be written over his name. This was a recurring occurrence and him defend his honor every single time. He claims that someone wanted to become famous posting these photos, by referring to two people in a case of vandalism. The main battlefield is the internet. Like in the past, where many fought for the kingdom governance of the street line, nowadays the battle has been moved online, and the territory is virtual, but the lines, the words matter. Cope2 does not hesitate to fight his battles on social media, but he strives to do it in a positive manner, spreading love instead hate, and keeping away from feeding the trolls. However, his sharp language hurt many and a lot of his contemporaries excluded him from the clique because of the online remarks. Not all time online was repetitive relying on hateful comments, his willingness to work hard for himself got him to collaboration with many galleries, commissioned work, to moving his work from the streets to small formats. His paintings were selling and still are selling, and the online haters are not important anymore. Cope2 has a positive philosophy of life but approaches it realistically. He realized on time he had to change since the world had changed, and when he became a grandfather at the age forty, he switched his priorities, from fighting for principles to fighting for legacy. 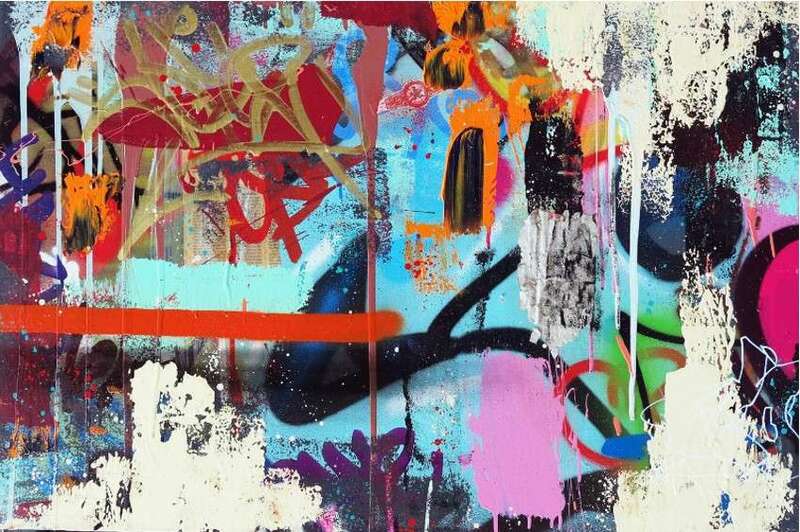 He finds inspiration in all of the works of Dondi, in successful artists like Kaws, Shepard Fairey, and Jose Parla. When he maintains his blog, he tries to promote himself, to write about his success, works, and to stay out of trouble. It doesn’t matter that he is already a legend in the graffiti world, for him, the learning process never stops. 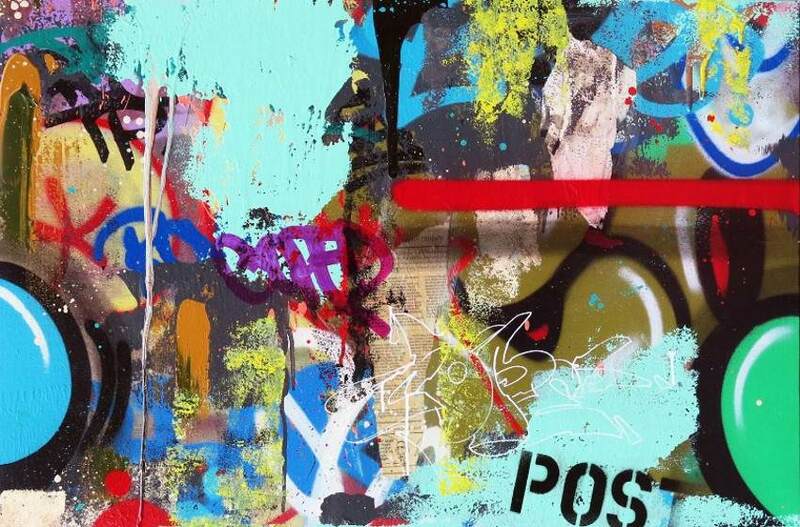 He likes to experiment with tools and techniques, and in newer street and gallery works Cope2 combined layers and drips, painted abstractions, even used old photographs in order to expand his design and make it more personal and authentic. The paintings he makes are honest, visually complex, and inspired by different energy. Having two open cases against him, he has to stay out of painting graffiti, at least the illegal ones. 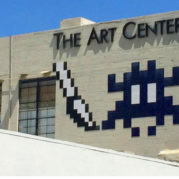 So, the gallery contracts were the perfect opportunity for Cope2 to continue to make art, but stay safe and sound. He is a family man, who has to take care of others, who cannot fight the neverending battle of gang vendetta. Revealing information on his friends and other artists was never an option, not even when he snitch rewriting took a toll on his reputation. His job is to stay true to his beliefs, so painting canvases still come straight from the heart, as well as the brand collaborations, but they come out of fun too. That little evolution for him was a necessary escape since the city changed so much. Cope2 is one of the old school legend, a member of the generation of a graffiti artist who risked everything for a tag and line. Before it was all about hierarchy and respect, it was about reputation and integrity. It was a time where no one could his behind the computer screen under the anonymous or alias name. 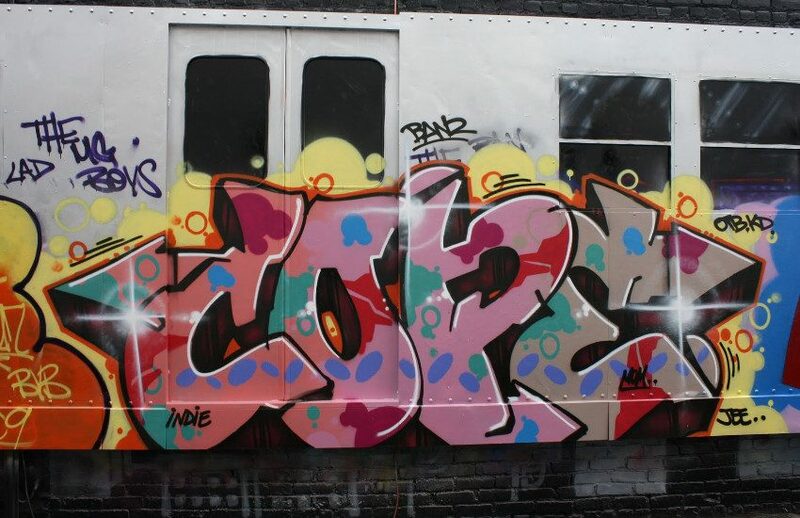 So, no one is bombing, throwing and experimenting, it is done differently nowadays, but the streets remember the days when Cope2 was the king of the line. Cope2 is represented by Galerie Mathgoth in Paris, Vertical Gallery in Chicago, 19Karen Contemporary Artspace in Mermaid Beach, Australia, Azart Gallery, New York and Galerie Onega in Paris.